Workers’ compensation can be invaluable when employees are hurt on the job, but unfortunately, these benefits do not extend to volunteer workers. Under Illinois laws, companies are under no obligation to provide medical and wage loss benefits to volunteers—leaving these workers to explore different injury compensation options. Accepting voluntary payments. Some companies or property owners will offer to pay for your medical bills if you were hurt while doing work for them. They may offer payment because it is the right thing to do, but they may also pay for medical treatment in exchange for your promise not to sue—and since they are not legally bound to pay, they can choose the amount offered and refuse to pay anything further. Proving you are an employee. Employers rely on the hard work of many different types of workers (including employees, day laborers, volunteers, or independent contractors), but only employees get workers’ compensation in Illinois. However, some volunteers may actually be considered employees depending on the duties they perform, the number of hours they put in, whether they receive any form of compensation, and whether they formerly worked for the employer. Filing a personal injury lawsuit. 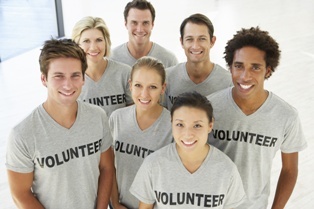 Volunteers are not covered under workers’ compensation, but they also are not bound by its limitations. Employees are barred from filing a lawsuit against their employers, but volunteers have the option of a personal injury lawsuit. Non-employees may pursue a premises liability claim if they were hurt while doing work on someone else’s property, or a car accident claim if they were injured performing service for an organization. In both cases, the volunteer will have to prove someone else was negligent in order to collect payment for medical bills, lost earnings, property damage, and other losses. If you have suffered a work injury, our workers’ compensation attorneys can advise you on your next steps at no cost to you. Contact Tapella & Eberspacher today at 855-522-5291 or fill out our online contact form to schedule your free consultation.